Wentworth is truly one of Australia’s great meeting places. Why? For thousands of years local Aboriginals have been meeting for corroborees and ceremony. Wentworth was one of Australia’s busiest ports during the paddlesteamer era of the late 1800s and the great rivers of the Murray and Darling join as one here. Wentworth is considered the gateway to Outback NSW, and is situated on the junction of the Murray and Darling Rivers in south­western New South Wales. 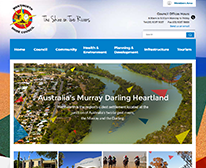 Mildura, on the Victorian side of the Murray, is our nearest main town and we’re only 280km from Broken Hill. 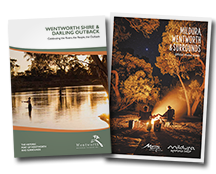 Wentworth Shire is a region of great diversity and it offers you the opportunity to experience an introduction to Outback Australia. When you have such great river and land forces working towards one rare and special landscape you know it’s an experience like no other. The outback town of Wentworth retains many historic buildings, including the Old Gaol, the Courthouse, the old Convent / Schoolhouse buildings and the Customs House. Junction Island is the name given to the sandy shoal between the two rivers. In the area you’ll find a series of special remnants of Aboriginal occupation and a landscape rich in flora, wildlife and birdlife. There is much more to our region though. Mungo National Park and the World Heritage Willandra Lakes lie about 150km northeast of Wentworth. The park features the Walls of China, spectacular sand dune formations, and several walks. More importantly it represents over 40,000 years of living culture in Australia on our doorstep. Captain Charles Sturt named the Murray River on 23rd January 1830 from the vantage point near the joining of the two rivers. 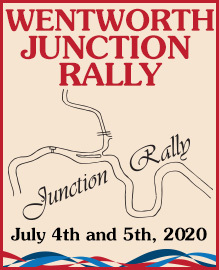 Wentworth was declared a town in 1859, and on New Year’s Day in 1862 the first race meeting was held. The course was the town’s main street, the finishing post a hotel flagpole and the balcony of the same hotel became the grandstand. Shortly after 1862 Wentworth became the centre of the mail network for western New South Wales. In the 1890s there were 92 paddle steamers working the Darling, and between 1860s and 1930s Wentworth was the busiest inland river port in Australia with over 450 craft using it in a year. 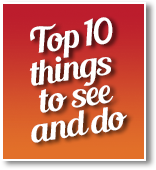 Today you can explore the best of Australia’s great rivers, the outback and world heritage landscape from one place. Take a river run along the Murray to Dareton, Buronga and Gol Gol to enjoy a round of golf or discover a winery. Or head north along the Darling River to the historic Port of Pooncarie. Locally you can enjoy Wentworth’s village feel and the heritage town drive or walk. The Port of Wentworth offers you much more than just being a great and ancient meeting place.